Spirit Mars - Solar System Planets And Moons Section. Spirit made in its first 70 days on Mars. 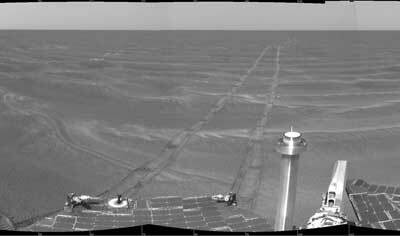 Opportunity breaks driving records on Mars. Even though they're well past their warranties, the Mars Exploration Rovers, Spirit and Opportunity are acting remarkably spry. Opportunity has just wrapped up three days of hard driving, covering more distance than Spirit made in its first 70 days on Mars. It set a one-day record, reaching 177.5 metres (582 feet) on a single day. The rovers have been using their autonomous driving mode to set their own routes around obstacles without micromanagement from controllers on Earth. Galaxy headed for a cosmic collision. The Hubble Space Telescope has taken a photograph of irregular Galaxy NGC 1427A on a death plunge into the Fornax cluster of galaxies. NGC 1427A has the beautiful blue colour of intense star formation, because gravitation interaction with the cluster has already collapsed much of its gas. Astronomers think that the Galaxy will be completely ripped apart within a billion years, and its stars assimilated into other Galaxies in the cluster. Astronomers have found a core burning star, like our own Sun, that's only 16% larger than Jupiter; although, it has 96 times as much mass. The observations were made using the European Southern Observatory's 8.2m VLT Kueyen telescope in Chile. Astronomers watched tracked 60 stars which were known to have a regular dip in brightness, when a dimmer object was passing in front. This survey found 7 of these low mass stars which eclipsed their brighter companion. Giant planets created primitive meteorites. Progress docks with International space station. The 17th Progress cargo ship docked with the International Space Station on Tuesday, delivering a pile of supplies. The ship is carrying air, water, food, equipment, and science experiments. But one of its most important cargoes is a new high resolution digital camera that the astronauts will use to inspect space shuttles when they dock with the station. The docking was completed autonomously; however, cosmonaut Salizhan Sharipov was ready at the manual controls to take over if there had been a problem.